Trombonist Tony Collins is in demand as one of the top freelance artists in the San Francisco Bay area. He frequently performs with many of the professional symphony orchestras in the area including The San Francisco Opera, Symphony Silicon Valley, The Western Opera Theater, The Oakland East Bay Symphony, The Marin Symphony, The Fresno Philharmonic, The Monterey Symphony, The Napa Valley Symphony, Opera San Jose, The California Symphony and the Santa Cruz County Symphony. 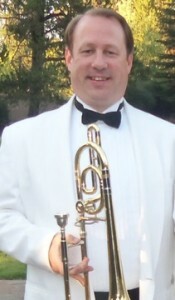 He holds the position of principal trombone with the Stockton Symphony and second trombone with the Modesto Symphony. Mr. Collins is well traveled as a musician. Having grown up in Atlanta, GA and earned his performance degree in New York at the Manhattan School of Music, he has performed with many of the countries top arts organizations including the Metropolitan Opera, The Atlanta Symphony Orchestra (with whom he has recorded two Grammy winning discs), The San Francisco Symphony and the Hollywood Bowl Orchestra. Among the jazz, and pop artists that Mr. Collins has performed with are The Four Tops, The Temptations, The Moody Blues, Yes, Lou Rawls, Tony Bennet, Dianne Schurr, Franky Valley, Vicky Carr and Ray Charles, Johnny Mathis, Big Bad Voo Doo Daddy and Chris Botti. Mr. Collins currently lives in Santa Rosa, CA and teaches at Sonoma State University, San Francisco State University and Santa Rosa Junior College. He is also busy as a solo and chamber musician.